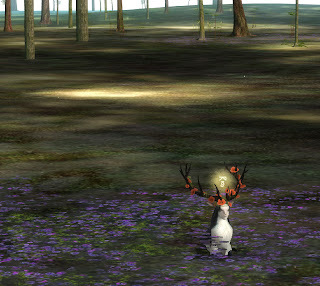 While we weren’t paying attention, the number of times that The Endless Forest has been downloaded jumped over the 100,000. The game has been downloaded 122,879 times to be precise. As far as we know, at least. 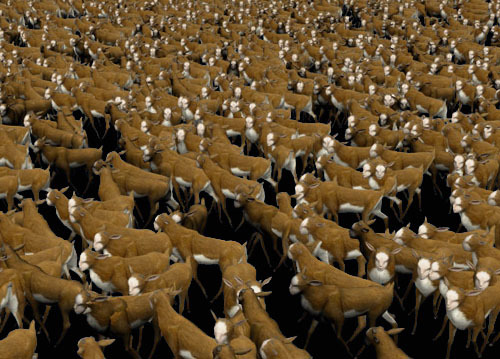 So far, some 17,000 players have named their deer (aka registered/joined). And lately, the number of active players per month exceeds 1,500. This is reflected in increased activity on the game’s forum. Research of the conclusion of the previous post lead to this beautiful page. Some quotes from the Eurogamer article. But here’s BioShock in August 2007, looking for all the world like a game that’s landed fully formed from a couple of years in the future. It’s a game that’s going to make a lot of rival developers either very excited or very depressed indeed over the coming months as they come to terms with how far ahead this game is – not just in technical terms, but in practically every other angle as well. Seriously – if you don’t find something to love about BioShock, we’d recommend a trip to the nearest doctor to check if your heart’s still beating. All I have to say is that if you don’t enjoy Bioshock ALOT then you’re not a true gamer. Never mistake “people” with “gamers”, Eurogamer. Thank you for clearing that up, DjFlex52. Tonight, Austrian national radio ORF 1 will be broadcasting a report on Belgian new media art, at 22.30, during the Matrix show. The half hour documentary was made by Armin Medosch after his visit to Belgium last Spring. You can listen to it only during the time of the broadcast by going to the channels website http://oe1.orf.at/ and clicking on ‘webradio‘ on the top. Simultaneously, a story about Tale of Tales has been published (in German). Furtherfield are featuring a retrospective of the legendary Net Art duo, Auriea Harvey and Michaël Samyn*, launching with a major two part interview with Maria Chatzichristodoulou (aka Maria X). 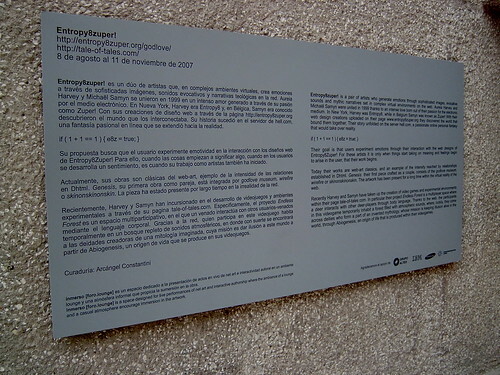 This reflects upon their lives, artworks, ideas, creative histories and their journey from Entropy8Zuper! to their current incarnation as a games development studio with a different approach, Tale of Tales. But it’s not really a game, is it? The key mistake made in the definition of “games” along traditional lines is that it ignores the major strength of the interactive medium. “But it’s not really a game, is it?” is no longer an acceptable way to look at a piece of interactive entertainment; its value must be measured in terms of sociability, narrative and even education. Interactive Entertainment isn’t just about “gameplay” – it has learned new tricks, and designers must now learn how to enthral people by creating social spaces and weaving compelling narratives. Read the entire article on GamesIndustry.biz. Author MichaelPosted on August 16, 2007 Categories Thoughts1 Comment on But it’s not really a game, is it? 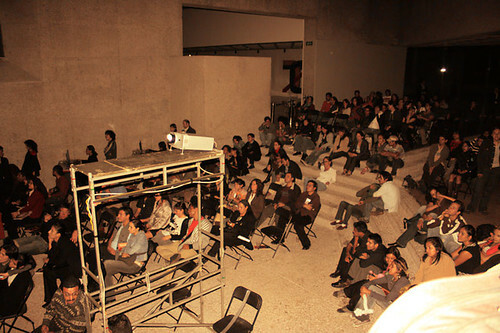 Over 350 people came to the Museo Tamayo cyberlounge to see us perform live The Godlove Museum and ABIOGENESIS. That’s a lot of people. Alex Mayhew is an artist. It is not often one gets to say this about somebody who works in interactive media. But he is one of those very few whom we can call an artist without ifs or buts. As such, the conceptual limitations of game design don’t mean much to him. He designs straight for the core of the matter: interactivity and you, the user. This doesn’t stop him from going on about fishing on the Wii or playing Loco Roco, though. 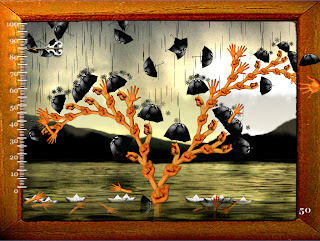 Alex is probably best known for the fabled Ceremony of Innocence CD-Rom, an interactive adaptation of Nick Bantock’s Griffin & Sabine saga, published by Peter Gabriel’s Real World in the nineties. But he hasn’t rested a single day since and never gave up on his dreams, hopes and desires. I have a feeling we’re in for quite a treat, soon! For starters, enjoy the interview! Indie + Art = Forest? According to Michal, Within a Deep Forest is the best indy art game of the moment, followed by yours truly’s The Endless Forest. Flow is only third because it doesn’t have a forest. But 12. Rainy Day and 14. Seiklus also seem to involve trees of some kind. Author MichaelPosted on August 2, 2007 Categories The Endless Forest6 Comments on Indie + Art = Forest?